We are a specialist chef recruitment agency with offices in London and Bournemouth, Dorset. 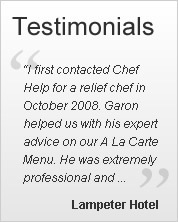 Founded by award winning chef, Garon Trivett. We pride ourselves on helping restaurants, hotels and private residences find the best permanent, temp chefs or relief chefs for their needs. We act quickly and offer competitive rates. We have very high calibre chefs on our books, ready for interview. Chefhelp provide high quality, reliable chefs as temporary solutions for sickness, holiday cover, busy periods, re-launches and every unforeseen situation where your kitchen is not fully staffed. We not only provide reliable, honest chefs, all of which are hand-picked, all our chefs are trained to help you improve the quality, presentation and taste of the food they serve. If you need a solution to your permanent, temporary or relief chef requirements, please contact us now. If you are a talented chef who is interested in temporary assignments, then please contact us with your CV.